The corp version of Easy Mark the bonus that Beanstalk has is its Transaction key word, which out of Weyland Consortium: Building a Better World makes it absolutely fantastic. Zero credits for four makes it as good as a Hedge Fund with less investment, and puts the corp up into range to quickly use Hedge Fund into Restructure. Unfortunately, it has fallen out of style. While it is a great way to jumpstart an economy that has fallen low (or even bankrupt) there are only so many deck slots. There are economy cards that give better profit (for more investment, of course, or more risk) that often work out better for the deck slots available. 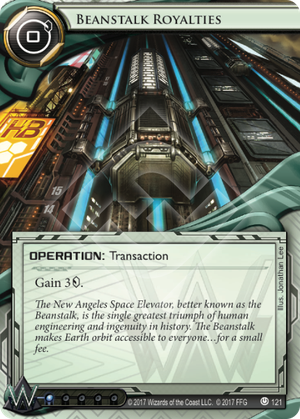 Economy creeps, one of the few things that gets progressively more powerful in Netrunner, and older cards like Beanstalk fall out of style to make room for economy that gives more total profit. It is still a good solid card; one card and one click to make three credits is a pretty standard baseline, and even other economy cards just get slightly better (one or two more credits) for substantially more investment.